Presidential Communications Operations Office Assistant Secretary Mocha Uson hits back at some senators who are now attacking her on various news media outlets for her controversial participation in the game show featuring Drew Olivar but they were silent on the issue of alleged cheating in the 2016 national elections. The controversy involving Asec Mocha Uson and Drew Olivar was sensationalized by the mainstream media as it became a hot topic in the issue about Federalism, the focus now is on the viral video of Drew Olivar and not the message about Federalism. In an interview with News5, Asec Mocha Uson was quoted as saying "Ako, nagtitimpi lang dito sa ilang mga senador na ito. Nagagalit kayo sa video na sinayaw ni Drew Olivar, kesyo binaboy daw and pederalism, pero no reaction kayo sa issue ng dayaan noong 2016." Mocha Uson stated. The most popular DDS Blogger, Asec Mocha Uson also added that "Pinipigilan niyo pa si Atty. Glenn Chong magsalita para lumabas and katotohanan. Sino ngayon ang mas baboy sa atin?" Mocha stated. Asec Mocha Uson's statement was made after the controversial Joint Congressional Hearing on Electoral Fraud conducted last Monday which suppose to feature Atty. Glenn Chong to add more substance to his earlier expose but his time was limited during the second hearing and if not for Sen. Sotto calling his name, he could have been a mere witness of the proceedings despite being a resource person. Asec Mocha Uson's statement against the some senators was made after Sen. Koko Pimentel, Sen. Risa Hontiveros, and Sen. Kiko Pangilinan to name a few called out Asec Mocha Uson's resignation due to her alleged disrespect to the controversial Federalism topic which is set to replace the current Unitary form of Government by amending some provisions of the 1987 Philippine Constitution. 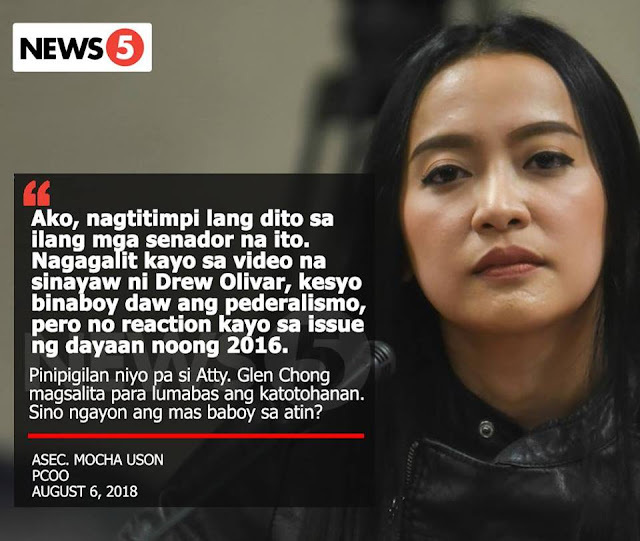 Meanwhile, netizens took to social media and shared their mixed reactions in the controversial video and the latest statement of Asec Mocha Uson. Louie Hernandez: Please kindly focus as well on the 2016 election fraud..dinaya po talaga yan. Dapat si Sir.BongBong Marcos ang panalo talaga dinaya ng smarmatic kasi binayaran sila ng milyong milyong pera ng bayan..tengnanyo! Lynlyn Maze: Very well said Mocha...actually nilihis nila ang issue para madivert ang attention ng madlang people..Ang HINDI ALAM NG LIBERAL PARTY NA MAALERTO NA NGAYON ANG MADLANG PEOPLE! Honky Toink: mocha’a issue is being used to cover up the real serious issue we should all be concerned about.